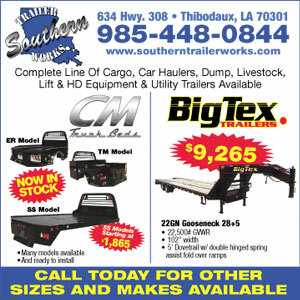 Southern Trailer Works is committed to providing our customers with the right equipment at the best possible price! We only represent the finest utility, cargo, equipment, race trailers and motor coaches from carefully selected manufactures like, Big Tex, Anderson, Pace American, Cargo Mate, Vintage, Falcon, Pro-Pull, LOOK and HAULMARK Trailers & Coaches and Now introducing CM Truck Beds with full parts & service. If we don’t have the trailer or coach that fits your needs, we will gladly design and have one built just for you! And when it comes to race trailers, we offer over 20 years of experience as racers ourselves. We demand the best and so should you! Let our experience help you select or design the right equipment for your application. Call today, we’re always glad to help. Ask about factory pick up and save! !